The family that would become Cognac Frapin can trace their lineage to 1270 in the Southwest of France when they first joined the merchant class as growers and producers of wine. Frapin is unique in that the lineage is transmitted through the women of the family, and has been over the successive 21 generations. The Frapin family is rightly quite proud of the set of ancestors that have come before them. Over the generations they have included the King’s Head of Kitchen-Sommelier in the 1500s to a famous French author, to King Louis XIV awarding Pierre Frapin a coat of arms in 1697. By 1872, the Frapin family finished construction on the home that would become the symbol for their House: the Château Fontpinot in the village of Segonzac. In 1892 the Frapin family contracted one of the titans of the age, Gustave Eiffel, to construct the iron framework of the Chai de Segonzac at the Frapin Estate. 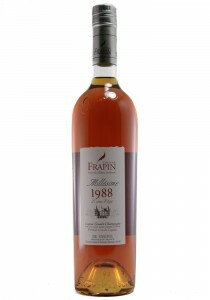 By the end of the 19th century the Frapin name had become synonymous with Cognac excellence with accolades from society and state. The 20th century continued much the same with a focus on land surrounding the estate and building up the family’s stocks of aged spirits. Today, the Frapin estate is composed of 593 acres of land surrounding Château de Fontpinot. The Grande Champagne grapes are harvested by hand and whole bunches are pressed immediately. The grape juice then undergoes a natural fermentation with no additional filtration or additives. Distillation at Frapin occurs twice in contact with the lees in six Charentais copper stills. The Cognacs of Frapin are matured in Limousin oak casks, at first in new casks, then they are transferred to older barrels to finish their ageing. The ageing chai(designed by Gustave Eiffel) are uniquely set over two levels, which means Cellar Master Patrice Piveteau is able to choose a location for each cask based on what he feels is the best warehouse microclimate for that barrel. The ground floor has greater humidity, while the attics are drier and warmer. These two climatic zones have a clear impact on the ageing process, and the character of the final Cognac.